The three forms of Therapy Services at Discovery Ranch work in combination to break down the barriers keeping your son from leading a successful life. 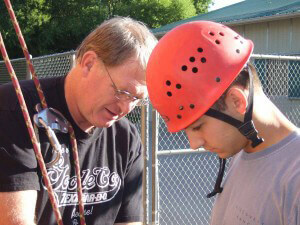 He will experience Formal Therapy, Experiential Therapy, and daily Experiential Learning activities. He will have many people to help him learn and grow. In fact, clinicians, teachers, and highly-trained staff are all involved in making sure that your son receives the best therapeutic care possible. Your son’s formal therapy might take place in an office, walking around our 20+ acre campus, or while working on the ranch. Therapy includes weekly individual, group, and family sessions. The combined therapy sessions average approximately 20 hours a week. Your son will also join in a weekly process group that will help him identify his feelings and discuss problems. In addition, he will be welcome to join any specialized therapy group that would be relevant to him. The specialized therapy groups include: drug and alcohol recovery, on-campus or off-campus 12 step AA/NA, self-harm prevention, eating disorders recovery, trauma recovery, adoption issues, coping skills building, team building, and peer leadership training. Your son will join in Experiential Therapy every week. He and his therapist might take part in equine therapy, a ropes course, or another recreational therapy activity. These activities are designed to be emotionally intense. They will take your son out of his comfort zone so he can begin to address his issues. Our therapists, teachers, and highly trained staff are ready to help your son reach his potential. Experiential Learning Activities will be part of your son’s everyday life. He will be involved in learning activities like caring for bottle-fed calves, community service projects, a sports league, and peer leadership projects. These daily activities extend the influence of therapy, which takes place both inside and outside the office. Furthermore, these therapeutic activities do not feel like therapy. This will make your son more willing to openly participate in discussions about his behaviors and emotions. In this way, he will have the opportunity to practice the therapeutic principles that he is learning all day long.